As ArtBridges’ Community-Engaged Arts Directory grows, we realize that it’s a bit overwhelming to read through all of the profiles. We’re hoping that by occasionally highlighting some profiles on our blog, you may learn about an initiative that you may not have initially seen in the directory. Also, if you know of a Canadian community-engaged arts for social change initiative that isn’t in our directory, but should be, please let us know! We love and need your input/feedback in building this resource! -Lisa, Content Coordinator at ArtBridges. 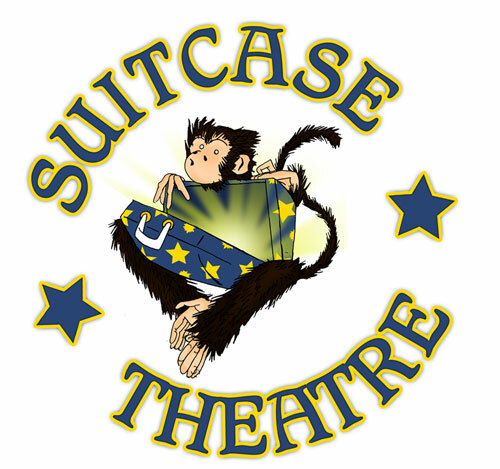 “Suitcase Theatre is a registered charitable organization that was founded by the original producer and creator of Mr. Dressup, one of Canada’s most loved and longest running children’s television shows. 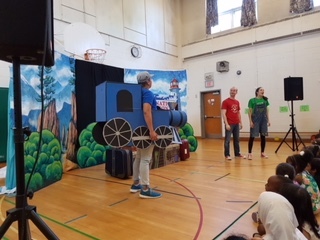 The theatre group performs at daycares, schools, hospitals, community centres, festivals and special events across Ontario. We also offer dynamic after school programs, camps and class workshops that focus on drama, improv, comedy, singing, dancing and the visual arts. Art Starts asked participants in their True Heart program “What has art started in your life?” watch their responses above. 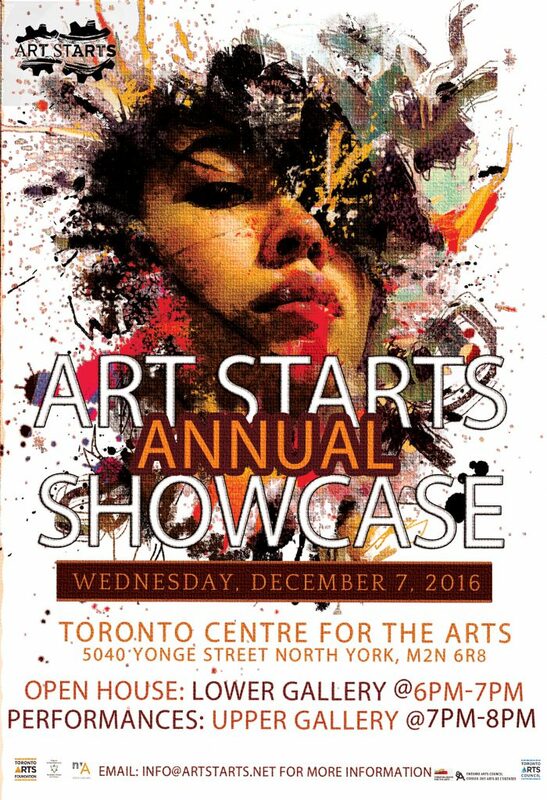 “Award winning community arts organization Art Starts is proud to present its 2016 Showcase on Wednesday, December 7th, from 6pm-8pm at the Toronto Centre for the Arts. This free event features an open house, visual art, music and dance performances. The event will celebrate city wide collaborations between artists and community members working in a variety of artistic disciplines. The Showcase unites people of all ages who have participated in Art Starts programs in the Eglinton-Oakwood, Villaways, Lawrence Heights and Glendower neighbourhoods in North York and Scarborough. “I am very excited and invite you all to attend this unique exhibition,” says Special Projects Manager Julian Carvajal, “you will have the opportunity to connect, interact and experience the vibrant streets of our neighbourhoods”. “The Showcase will feature an abundance of talent, grass-roots collaboration and inspiring creativity”, says Art Starts Interim Executive Director Tamara Haberman. Art Starts is a charitable organization that has been bringing professional artists and underserved communities together in community-building arts programs for over 23 years. They are the winners of Toronto Arts Foundation’s 2013 Arts for Youth Award. WHEN: Wednesday December 7th, 2015. 6-8pm. Come Express the things that make you tick through an 8 week summer camp exploring video, photography & sound. Once you have had a chance to blow off some steam you will get the opportunity to showcase your digital creation for others to see. 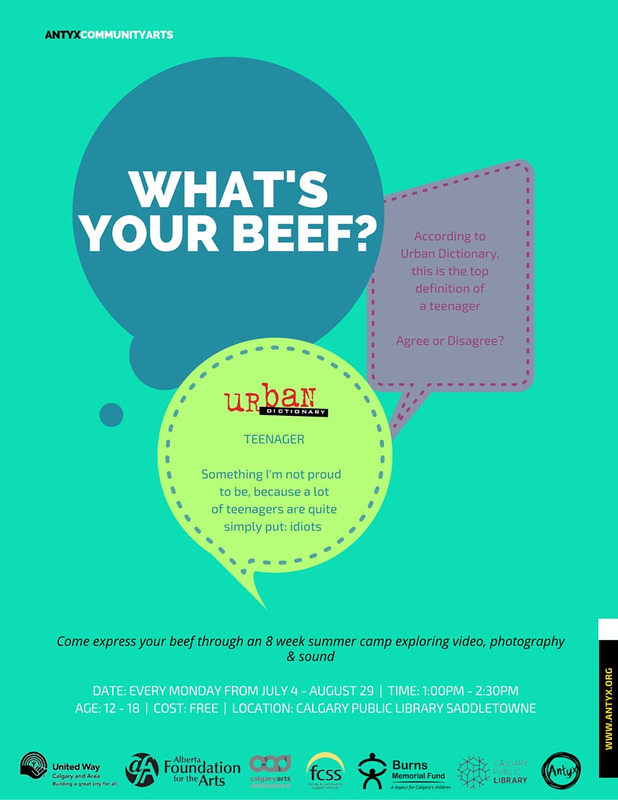 Join Antyx Community Arts & Calgary Public Library for an upcoming summer project that allows youth to disprove the age, gender and location biases. Prior experience with digital equipment is not required. Due to the small class size and open learning environment, each student receives ample personal attention and comes away with working knowledge of videography, photography, and digital story telling. The festival is free and open to all! 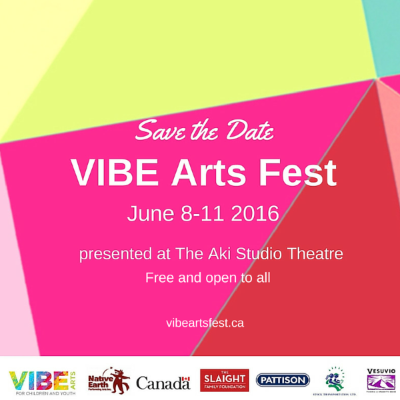 Showcasing VIBE Arts programs & celebrating Toronto’s next generation of artists! ! ! VIBE Arts Fest brings VIBE Arts’ program participants and artists from all over Toronto together to share creative energy, artistic skill, and community. Experience visual arts exhibitions, art activities, and performances from VIBE Arts’ children and youth participants, emerging artists, and Platform A micro-grant recipients. To read more about The Rap Camp, please see their profile in ArtBridges’ Community-Engaged Arts Directory and Map. To read more about Paint A Smile, please see their profile in ArtBridges’ Community-Engaged Arts Directory and Map. This week, DAREarts will blend the community’s love of hockey with the arts to address good sportsmanship, anti-bullying, culture and intergenerational collaboration. 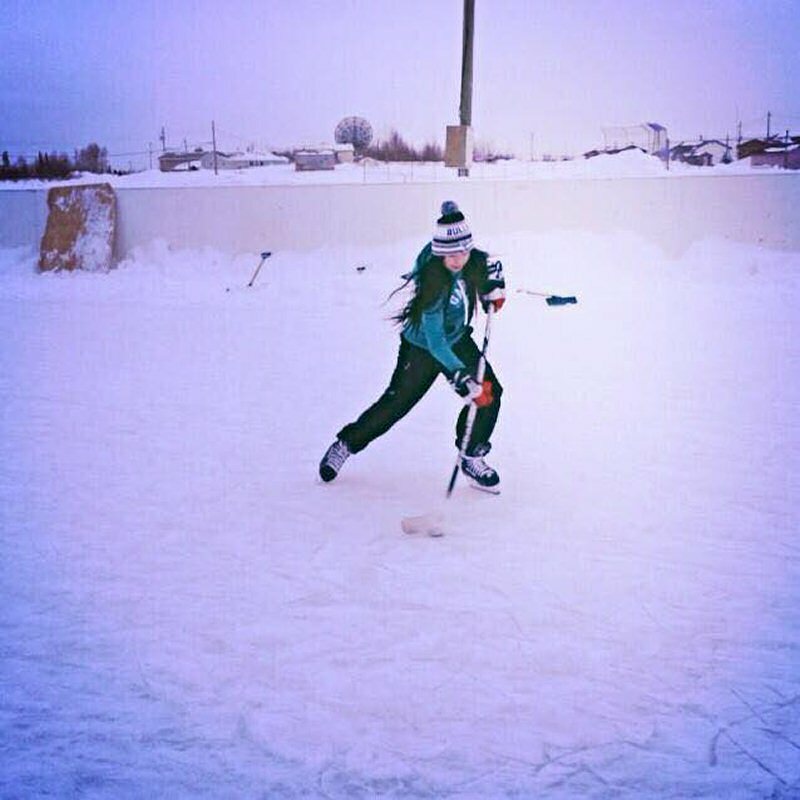 Guided by the DAREarts team of Indigenous artist Cathy Elliott, Juno-nominated musician Glen Marais, and Lead Teacher, Laura MacKinnon, along with community elders, the youth will explore the Indigenous history of hockey (they invented the game! 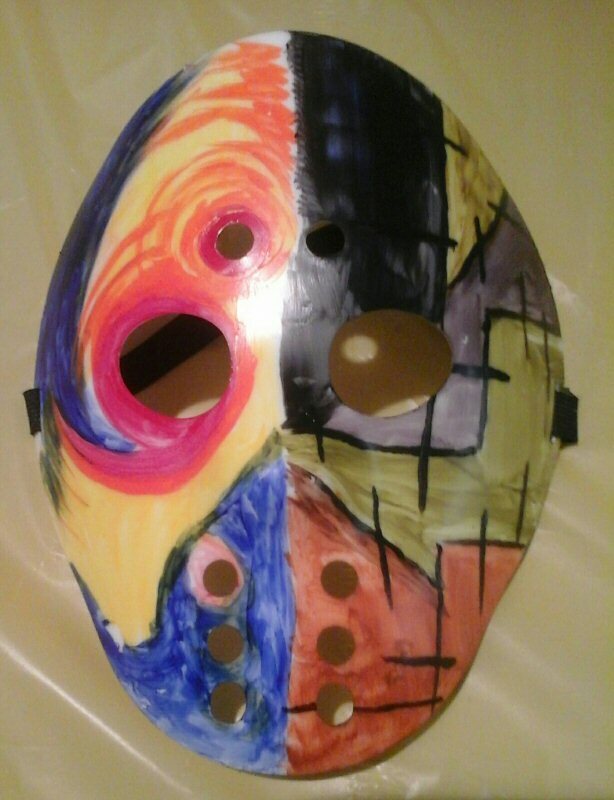 ), paint hockey masks and compose an original song to be performed with hockey moves and traditional dance at the community-wide PowPow on February 20th. The project will be posted on social media and showcased at DAREarts First Root Feast in Newmarket, ON February 25th. DAREarts First Roots program is part of DAREarts’ national initiative to give underserved youth the confidence, courage and leadership skills to resist negative peer pressure so they can ignite positive change in their lives and in their communities. Due to the remoteness of Aboriginal communities, the DAREarts team flies into communities for one to three week-long periods to work alongside local Aboriginal artists and elders. In addition to Webequie, ON, DAREarts has been invited to numerous other First Nations communities and is currently seeking funding to meet these invitations. DAREarts is a 20 year old national charity (#88691 7764 RR0002) that empowers underserved Canadian youth with the confidence and courage to ignite change as leaders, using innovative arts education. Recognized for its role in the development of leadership in at-risk kids across Canada, DAREarts continues to reach out to more communities across the country. DAREarts stands for Discipline, Action, Responsibility and Excellence. DAREarts’ 5-year program works with 9-19 year olds from schools in underserved communities, empowering them to be leaders. For more information, visit www.darearts.com or visit http://www.darearts.wordpress.com. Posted with permission from Marilyn Field. All photos courtesy of DAREarts. 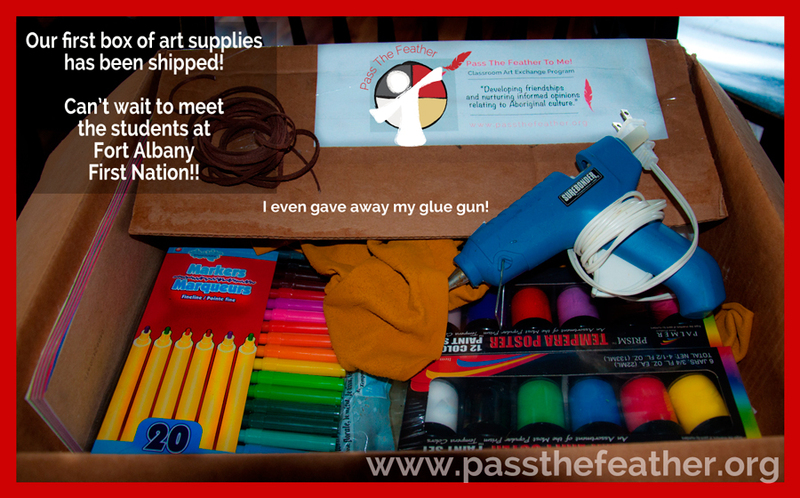 “The Art For Aid Project is working to establish a transportation network to get art supplies into remote schools. 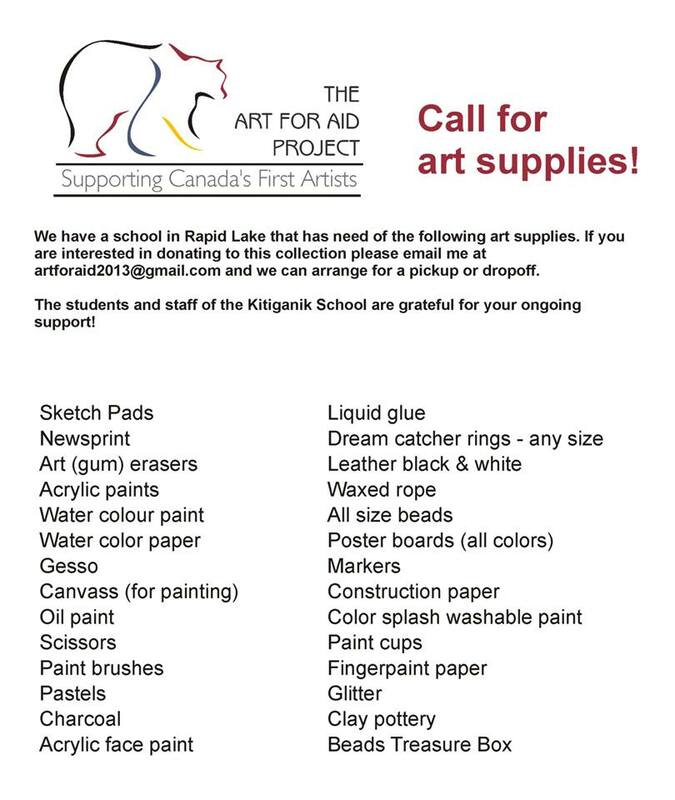 If you know of someone who is in (or driving through) the Ottawa area and might consider bringing a box or two of supplies to a remote Canadian Aboriginal school. All boxes are open to inspection and determination of contents before being accepted for transport. 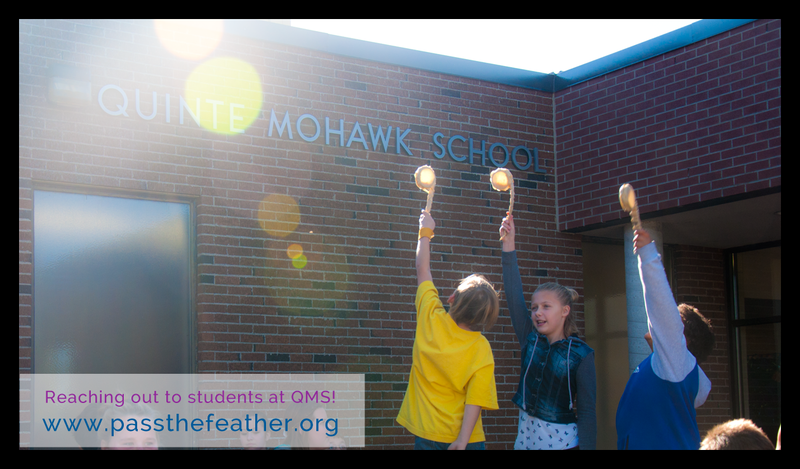 “Pass The Feather To Me! 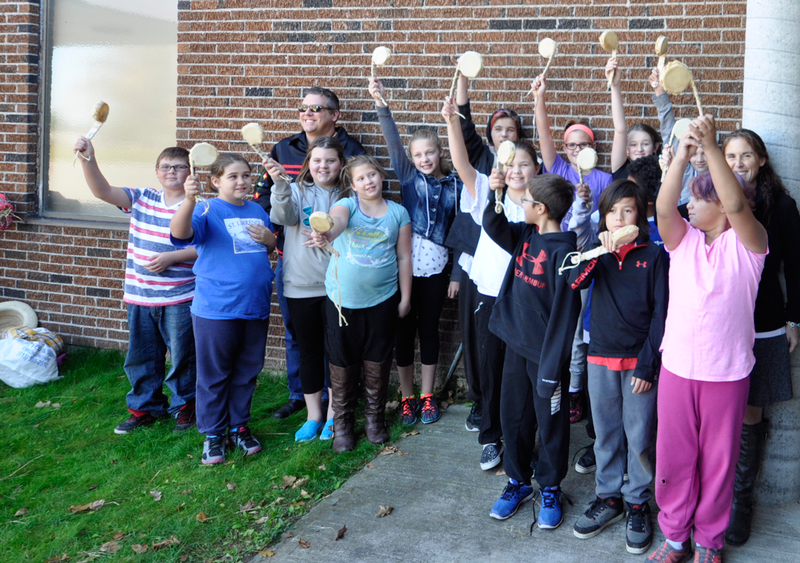 A Classroom Art Exchange Program is creating exciting friendships between Aboriginal and non-Aboriginal youth, teachers and artists using visual culture to transcend logistic and financial barriers. We are creating co-operative and respectful interrelations for future generations. – Show respect and reciprocation to our Elders and their teachings. Art is our most powerful tool of expression in Aboriginal culture. Through visual culture Indigenous students, teachers and artists are more willing to reach out and re-conciliate with their non-Aboriginal peers and colleagues. It is empowering and important to the co-operative future of our nation. 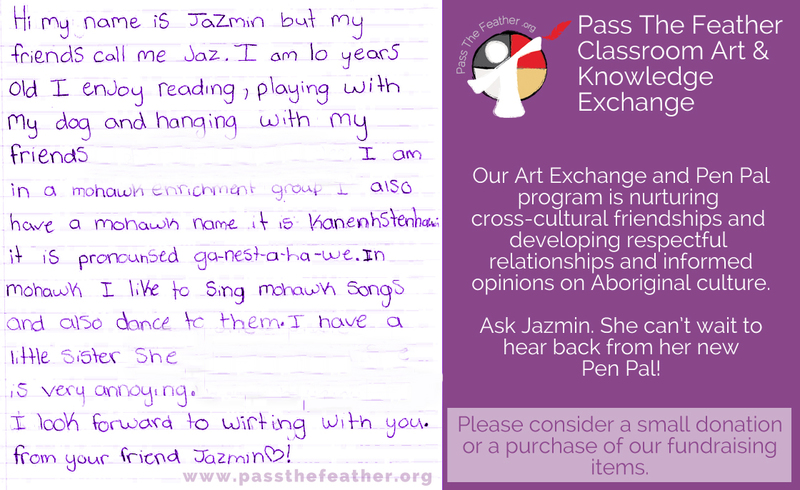 For more information about Pass the Feather to Me!, visit http://passthefeathertome.org/classroom-art-exchange-program/ or contact Dawn Setford at contact@passthefeather.org to learn how you can help support this project.